A mixture of shock and dread has been circulating among Chicago’s arts community since Threewalls, a nonprofit gallery and longtime fixture of the alternative arts scene, announced it could no longer afford its West Loop loft space. Albeit saddening, the news came as no surprise to those who have witnessed the past decade or more of the West Loop’s aggressive development from meatpacking and cold-storage warehouses to luxury condos and Michelin-starred restaurants. As former Newcity art editor Jason Foumberg recently reported in Chicago magazine, more gallery move-outs are slated for the summer to make way for development projects, and by the fall, there will be little left of the West Loop art scene as we know it. It’s absurd to mourn the inevitable result of a process that the arts were instrumental in realizing. It’s equally absurd to willfully forget that the spaces the West Loop galleries occupied were once the sites of industries that employed more people than the whole of Chicago’s art economy ever will. Problematically, art’s role in gentrification is a fact that seems troubling to cultural workers not so much because of the damage it does to communities of color, but because the fact of that damage threatens to undermine the purported values of the art itself. After all, what good is art if it cannot seize the inherent power of its complicity and turn it around to make positive change? This is a question that Threewalls, as a nonprofit with an explicit community-oriented mission, will have to reckon with as it seeks a new home in a neighborhood that will necessarily be less affluent than the one it just left. The departing commercial galleries have a different prerogative: how to drive foot traffic and sales to support their artists in further flung neighborhoods? In truth, these goals are not so different from each other, and one wonders if it really makes sense to be a nonprofit these days when private buyers have more funds than the public is currently willing to offer. With all this in mind, I’ve been looking for alternatives to the alternative art scene. Last week, I visited the Stolbun Collection, a new space run by Seth Stolbun, a painter who studies at the School of the Art Institute. On Michigan Avenue across from the Cultural Center, he hosts exhibitions in a room the size of your therapist’s downtown office, but with all the immaculate austerity of a professional, white cube operation. 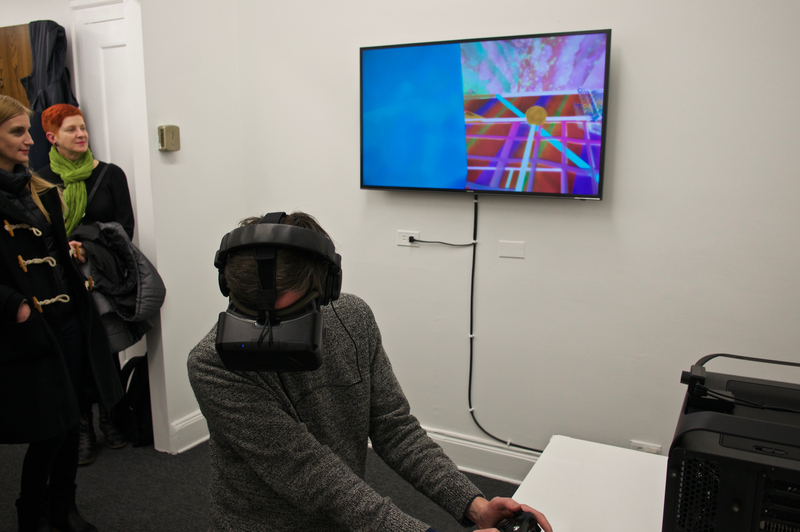 For a few more weeks, Stolbun is presenting the Chicago debut of the Digital Museum of Digital Art (DiMoDA), a digital exhibition platform devoted to art conceived and realized in virtual spaces. Unlike other online art presentations like the Google Art Project, the artworks exhibited in DiMoDA are designed exclusively for virtual exhibition without any “real life” antecedents. The project is the work of Chicago-connected artists Alfredo Salazar-Caro and William Robertson. Sitting down in front of a blackbox computer, I donned the Oculus Rift, a set of head-mounted virtual reality goggles that displays an eerily three-dimensional image and tracks one’s head movements to reveal the virtual space in full surround. The interface is far from realistic—DiMoDA’s graphics lag behind those of the latest video game technologies—but the dimensionality and field-of-vision tracking make for a compelling simulation of movement in space. The museum itself is an imposing, futuristic edifice surrounding an expansive inner courtyard with a reflecting pool lined by numerous palm trees, topped by a geodesic glass dome ceiling and filled with four Greco-Mayan portals that lead to immersive exhibits designed by invited artists. For this version, it’s Claudia Hart, Tim Berresheim, Jacolby Satterwhite and a collaboration by Gibrann Morgado and Salvador Loza. Each exhibit takes different advantage of the unique conditions available in presenting art digitally, including low gravity, the ability to climb on installations, and the creation of artworks that could not have been realized in “real life,” a term that seems increasingly hazy as one explores the digital museum. That is, until the slight visual distortions and subtle lag in graphics begin to produce an acute sense of motion sickness. Then, the goggles must come off. Cynics might criticize DiMoDA’s non-material existence, but they would be on the wrong side of art history. Artists have been experimenting with computers since their invention, keeping pace with technological developments and sometimes instigating innovation through the novel demands of their practices. Perfectly in pace with the technologies of our time, DiMoDA answers an emerging question: Now that digital art is here to stay, what is the appropriate space to exhibit it? It’s surprising that it has taken this long to realize that the answer is a digital museum. Thomas Kong. untitled cut-paper collages, circa 2010-16. 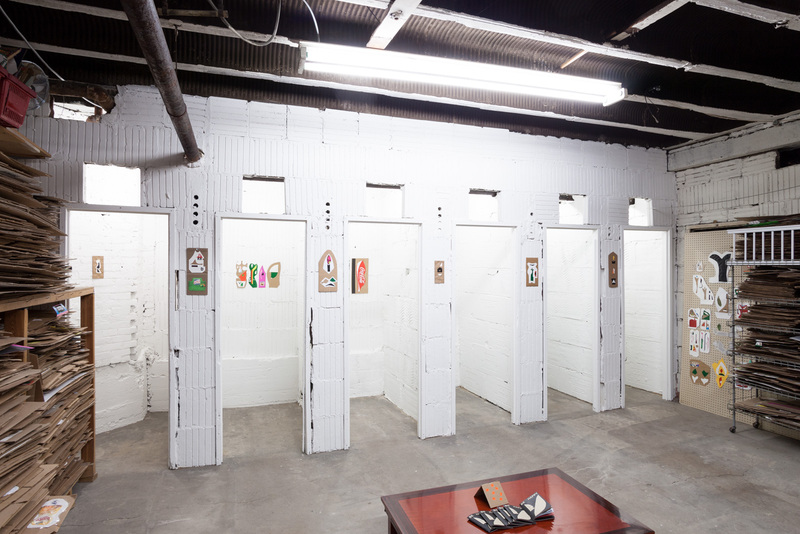 Installation view, “Selected by Steven Husby,” The Back Room at Kim’s Corner Food, January 24–April 4, 2016. Back in the real world, the upset at Threewalls dealt a blow to Chicago’s self-image as a city rife with alternative art spaces that thrive despite little financial support. However, its recent turmoil might serve as a helpful lesson for emerging alternative projects. Perhaps growth is not the right model, and maybe it doesn’t make sense to emulate established institutions when there is already so little room at the top. I found myself wondering these things as I spoke recently with Dan Miller in The Back Room of Kim’s Corner Food, a convenience store and gallery in Rogers Park operated by Thomas Kong. Over many years, Kong has filled his ground floor shop with collages made mostly from leftover product packaging materials. The result is a stunning exercise in site-specificity: collages emerge from the chaos of canned goods and cigarette cartons like so many camouflaged surprises. The symbiosis between material and context is so dense as to appear at times indistinguishable. With Kong’s arrangement of forms in the space of each collage and each collage arranged in the space of the store, the entire place becomes a work of art. And, unlike much art these days, it rewards careful, sustained looking. Miller, an artist who came to the United States from Australia to get his MFA at Northwestern, met Kong after passing by his shop and noticing the curious decorations on its windows. Over time, Miller partnered with Nathan Smith and Kristin Abhalter of the nearby Roman Susan gallery to help Kong build a website and exhibit work in group shows. Most impressively, they answered Kong’s dream to have a gallery in an unusual way: by clearing out the store’s back storage room and transforming it into an archive of Kong’s work. Twice so far, Miller has invited other Chicago artists to comb through Kong’s oeuvre and curate a selection in the whitewashed, brightly lit, former storage bays of the semi-subterranean gallery, now called The Back Room. Both curators so far have been abstract painters whose formalist sensibilities did wonders with Kong’s cardboard-backed collages. Steve Husby, whose selection is currently on view, also produced a handsome zine with an interview between Kong and Miller and “typologies” of Kong’s forms. Later this year, former Chicago art maven Jason Lazarus will make a selection from Kong’s work, and Miller is bringing a stack of collages down to Tampa for a show at Coco Hunday, Lazarus’ new garage gallery. 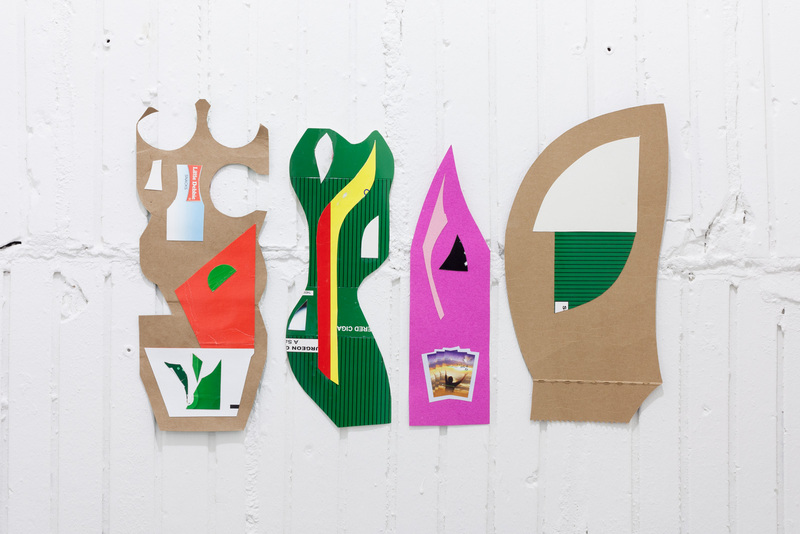 Installation view, “Selected by Steven Husby,” The Back Room at Kim’s Corner Food, January 24–April 4, 2016. Miller is careful to distinguish what he does in The Back Room from curating. He thinks of himself more as a facilitator or a producer, a term that foregrounds the collaborative conditions of this aspect of his practice. Indeed, the art world has historically maintained the illusion of singular authorship despite all evidence to the contrary. With thousands of MFAs conferred each year in the United States alone, the current system is not only dishonest, it’s unsustainable. In Chicago, projects like DiMoDA and The Back Room point the way toward new spaces for art and collaboration, alternatives to the alternatives that are currently failing.